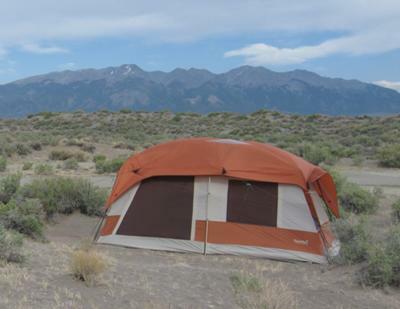 The Eureka Copper Canyon 1610 is an incredible family tent! I bought our tent in August 2010. We have taken it out on 3 camping trips in less than a year. It has performed beautifully through a Spring thunderstorm in Arkansas and just recently endured 5 days of extremely high winds (gusts to 40 mph) at the Great Sand Dunes in Colorado. I am extremely happy with the tent and impressed at how sturdy it is and at how well the tent has performed on what could have been a couple of diasterous camping trips. I am now convinced that we can count on the tent on any occasion. The Eureka Copper Canyon 1610 is a large and heavy tent which is really suitable only for car camping. I wanted a tent that we could stand up in and be comfortable. This one has vertical walls and is tall enough that my 6'2 husband can stand up straight inside without hitting the top. I was a little hesitant at first to buy such a large tent, but now I am really glad that I did. The tent has 2 seperate 8'x 10' rooms. Note that 1 room has a floor & the other room does not. We use the room with the floor for sleeping & the other room without the floor for storing gear and as a screen room/shelter depending on the weather. If it's raining or windy we bring our chairs inside for shelter. It also is nice to have the separate sleeping area that is easily kept clean. The tent poles are color coded, the center poles are a light color where the end & top cross poles are black making it easy to determine what goes where in set up. We first put down a large tarp that is big enough to cover the entire tent, then set the tent up on top of that. In the screen room we then put down an additional smaller tarp fitting that room, it makes it easy to clean & keep clean that way. Also with the extra tarp down it would be possible to use the screen room as an additional sleeping area if needed. In the screen room there are little loops all around the top that work great for the rope lights that can be bought, it makes for a nice atmosphere at night. There also is a port on the side of the tent specifically for bringing power in to the tent. I attach the rope lights to the loops with twist ties making them easy to put up & take down. I bought an extra string of lights to use around the camp outside the tent. Another use for the loops inside are to hang hangers for jackets or to dry towels or clothes. The tent has an open screen top as well as plenty of windows for ventilation. The windows do close up tightly in case of rain. During a Spring thunderstorm the tent did not leak a single drop of rain. All seams are sealed, but I did go ahead and apply an extra silicone sealant. This should be done to any new tent. The rain fly works well and also has handy pockets for the tie downs so they don't get all tangled and messy on set up or tear down. Overall for our family and our needs, this tent ranks a 10. Join in and write your own page! It's easy to do. How? Simply click here to return to Eureka Camping Tents - Reviews and Ratings. 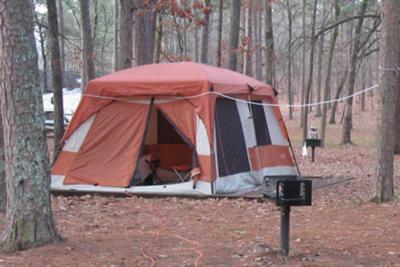 The Eureka Copper Canyon 1512 tent is a great buy and wonderful tent for a family. With two rooms large enough to handle today's standard, double height, queen air mattresses and loads of room for all of your gear. Setup could be achieved by one, but it is a great help and expediter to have the help of a second person. The poles of the Eureka Copper Canyon 1512 tent blew me away with the thickness of the fiberglass. If you get attacked, these things are thick enough to beat off any attacker in a pinch! The poles are the heaviest item to the tent and are well built--no fear of breakage or collapse here. The front awning works well, but there are limited directions as to its use. I read in other Eureka Copper Canyon 1512 tent reviews that the awning was useless and it left a gap--well, if you connect it as the directions say, then pull the synch straps tight, it works well. You have to re-route the center pole guy to the center pole of the awning, then guy down it works well. No leaks and a great area to keep your shoes dry at night. The Copper Canyon 1512 tent by Eureka has great ventilation to keep you cool when it is warm, as well as enough ventilation with the windows closed in a rain storm. The Copper Canyon 1512 is definitely a great buy for the money for camping out.